It is harrowing footage. An emaciated polar bear searches for food on Baffin Island, north-eastern Canada. Exhausted, it drags one leg slowly behind it, eventually trying to eat some discarded seating foam among rubbish humans have left. Polar bears hunt from the sea ice, which is diminishing every year, and the photography team are certain the unfortunate animal died within days. "This is what starvation looks like," wrote one of the photographers, Paul Nicklen. "The muscles atrophy. No energy. It's a slow, painful death." 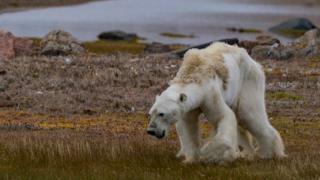 Mr Nicklen's colleague, Cristina Mittermeier, said: "We cried as we filmed this dying bear. This is the face of climate change." The clip has gone viral, widely shared as a warning about the dangers of climate change. But is there more to it? Mr Nicklen and Ms Mittermeier are co-founders of the conservation group Sea Legacy, with a declared mission to "use the power of storytelling to create the change we want to see". Canada's National Post newspaper argues: "These images aren't the work of a scientist, an impartial documentarian or even a concerned bystander. They are part of a very calculated public relations exercise." This particular animal could also simply have been sick. Biologist Jeff Higdon, writing on Twitter, speculated that it could have some form of aggressive cancer. "It's not starving because the ice suddenly disappeared and it could no longer hunt seals," he said. "The east Baffin coast is ice free in summer. It's far more likely that it is starving due to health issues." However, he warned that he could not be sure. Polar bears feed intermittently, often going long periods without food and feasting on huge quantities of seal meat and fat when available. Leo Ikakhik, who has spent years monitoring polar bears in Canada's Nunavut region, told CBC starving bears were not unheard of. "I wasn't totally surprised," he told the broadcaster. "These things happen. Everybody probably was shocked to see a really skinny bear, but this is not my first time seeing something like this." He also speculated that the bear was either ill or suffering from an injury that prevented it from hunting. Despite the controversy, photographer Paul Nicklen made clear from the start that the polar bear's history was unclear. "We cannot prove that he is in this condition because of a lack of sea ice," he wrote in his original August caption. "But is it a glimpse into the future as ice reaches its lowest extent in recorded history?" Speaking to National Geographic, Ms Mittermeier said : "Although I cannot say with certainty that this bear was starving because of climate change, I do know for sure that polar bears rely on a platform of sea ice from which to hunt." Both photographers have been criticised for not helping the bear but feeding wild polar bears is illegal in Canada - and even if it was, Mr Nicklen said, "it's not like I walk around with a tranquiliser gun or 400 pounds of seal meat". Ms Mittermeier told National Geographic: "Approaching a starving predator, especially when we didn't have a weapon, would have been madness." "I am trying not to be hurt or saddened by the many negative comments generated by this story," she added. "Instead, I am focusing on the thousands of positive reactions."